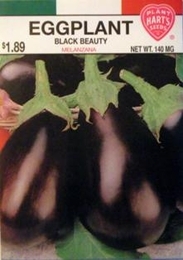 Black Beauty is a vigorous grower that will produce 4-6 fruits on plants that grow 24-30 inches tall. The mild flavored fruits are very dark purple, smooth, glossy, uniform excellent for slicing or stuffing. Eggplant requires warm weather for best results so it is best not to set them out too early. Maintain good fertility during the season. Cut instead of pulling from plant to avoid injury. 6500 Seeds/oz. Plant 1/8oz per 100ft row. 2lbs of Eggplant seed needed per acre, 2oz needed per acre if using transplants. On average, 1oz of seed can produce 1500 Eggplant plants.